Over/Under: Over 153.0 at 1.90 Bet Now! 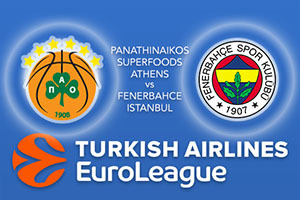 The home team is looking to grab a third consecutive win at home but many in the home crowd will be preoccupied with welcoming Fenerbahce coach Zeljko Obradovic back to Athens. This is because Obradovic was the coach for Panathinaikos between 1999 and 2012, which brought a lot of joy to the Super Greens. When it comes to history, Panathinaikos hold a 9-0 record at home over Fenerbahce in recent times, and will be confident of grabbing a win in this game. The hosts are currently 6-5 for the season but this includes a 5-1 record at home, so there will be an expectation that Panathinaikos can do the business in this game. Nick Calathes has been on top form so far this season, providing an average of 13.1 points per game, an average of 5.2 rebounds per game and 6.6 assists per game. This overall form has been a big factor in Panathinaikos’ good run of form and if Calathes performs well on Friday, the home fans should be happy. Chris Singleton has also been on form, offering an average of 11.5 points per game while KC Rivers has provided an average of 11.4 points per game. The Turkish team are looking to follow up last season’s form with another good campaign and they are currently enjoying a four game winning run. This means the current record for Fenerbahce stands at 8-3 and there are a number of players who are impacting on games for the Turkish side. Kostas Sloukas has provided an average of 12.4 points per game, Bobby Dixon has offered an average of 11.7 points per game while Ekpe Udoh has offered an average of 11.7 points per game and 7.7 rebounds per game. It is shaping up to be a thrilling game on Thursday night, which is exactly what people want from the Euroleague. Look to back Fenerbahce Istanbul at +2, at odds of 1.90 in this game. For the Over/Under market, look to go OVER 153.0 at odds of 1.90. Bet Now!